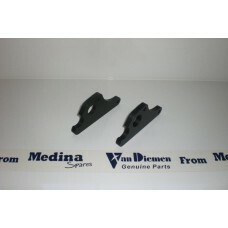 Home » Engine & Gear Box » Medina Rear Anti Roll Bar Brackets. Medina Sport Designed Rear Anti Roll Bar Brackets - Fits all LD200 Gear boxes using Outboard Rear Roll Roll Bar . Lower Pickup Points to avoid fouling bodywork on RF99 etc. - manufactured in Anodised Aluminium . Designed with F3 Type Jacking Point.